Tejalben is 44-year-old woman from Gandhidham in Kutch district of Gujarat. After her husband's death, she has has been working hard to raise her children. Her family consists of two sons and a daughter. With no education, she had no other option but to join labour work in a company to support her family. Few years back, her eldest son had to join the the same work to manage the rising expenses. Together, they earn Rs.15,000 per month. This income is mostly spent on their household expenses and they are left with little savings. 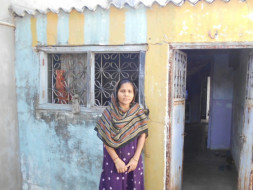 To improve their living conditions, Tejalben wants to construct a new room in the house. But with her limited savings, she cannot afford to shell out a big amount at once. Hence, she has approached Prayas (Milaap's field partner) to seek a loan of Rs.50,000 to fund the construction of a new room. The loan amount will be used to purchase the required construction materials such as bricks, cement, sand, etc. The loan amount will be repaid in monthly instalments over a period of 24 months.